Wall mounting hardware for all types of Sisal (steel tip) dartboards. If you are purchasing a new dartboard, this type of kit is usually included. 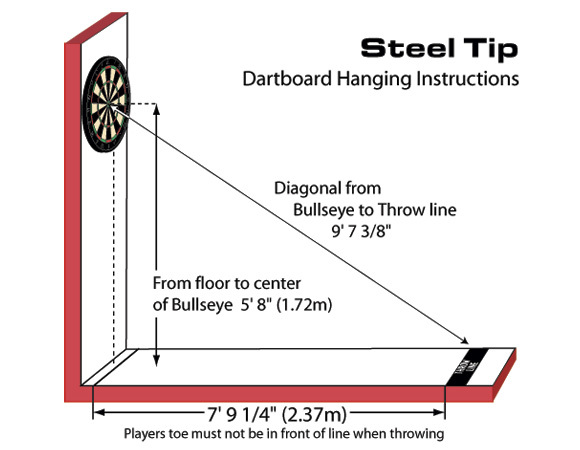 The wall mounting kit is hung so that the bullseye of the dartboard meets the specifications shown below. The distance for throwing steel tip darts was standardized in the 1970’s for international competition and measures 7’ 9 1/4” from the face of the dartboard to the toe line not the wall. In order to conform to this standard, you first measure the height and hang the dartboard then drop a plumb line or string from the face of the dartboard to the floor then measure back to the front of the throw-line. An easier way to measure distance is to have someone hold the tape measure touching the double bulls-eye and stretching diagonally to the floor 9’7 3/8”. For those math whiz, this is a right angle and the diagonal measurement is the hypotenuse (Pythagorean theorem). Always measure to the front of the toe line as everyone likes to stand on the line itself.